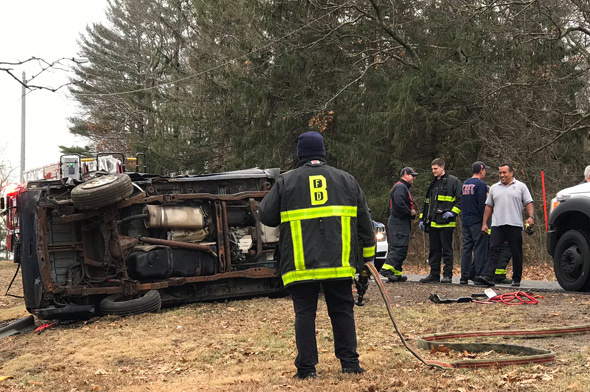 A driver managed to roll his SUV over on West Roxbury Parkway just north of Washington Street around 1 p.m. B2 Beighlie, who came upon the scene and got pictures, reports the driver was walking around afterwards, but apparently had a sneaker come flying off during as his vehicle wound up on its side. Read more. MassDOT reports it will be shutting the West Roxbury Parkway bridge over the train tracks near Belgrade Avenue for repairs from Saturday until Monday. Read more. Three possible routes for a West Roxbury parkway. See it larger. 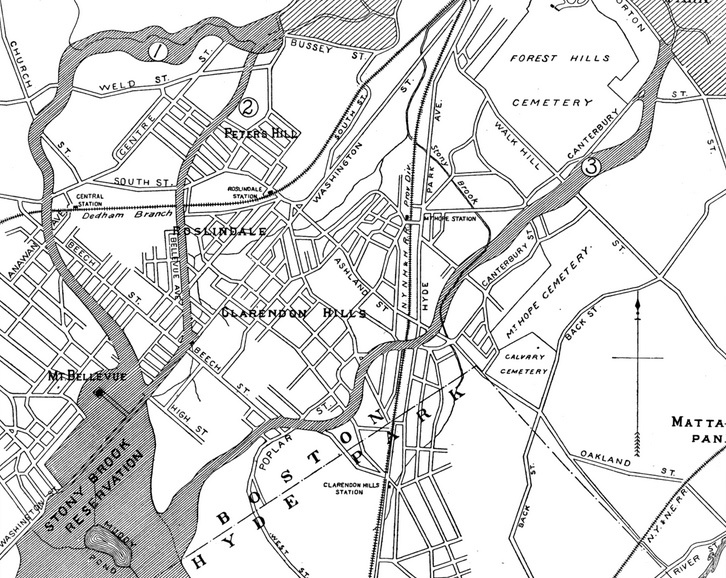 In the mid-1890s, city officials began looking at connecting the new city-owned Emerald Necklace parks with the giant Blue Hills Reservation the state Metropolitan District Commission was putting together just south of the city and the town of Hyde Park. Read more. Larry, the formerly peaceful turkey turned fire-spitting hellspawn by a misguided, if well meaning motorist, is upping his game - and his attacks on cars at VFW Parkway and Baker Street in West Roxbury. Read more. Just north of Washington Street, shortly after 4:30 p.m. Peter Amstutz reports one person was taken away in an ambulance, another appeared to walk away. UPDATE: WCVB reports the victim was shot at Washington-Beech, and that he was then dumped out of a car near the parkway. Shortly before 6:40 p.m. on Washington Street near the CVS parking lot by West Roxbury Parkway. The person's injuries were serious enough to have the homicide unit called in just in case. A. spotted this car on its side after a crash at West Roxbury Parkway and Weld Street shortly before 7 p.m.
Officials at Roxbury Prep managed to provide a presentation on their proposal for an 800-student high school on Belgrade Avenue at a meeting tonight at which they were accused of getting ready to ruin the neighborhood, by people who said they don't understand why the school can't put its building someplace else, someplace more "central" to students from Dorchester, Roxbury and Hyde Park than the Roslindale/West Roxbury line. Read more. After nearby residents told him how much they hated the idea of a five-story apartment building with a two-level garage on the triangle where Belgrade Avenue, Beech Street and the West Roxbury Parkway meet, new site owner John Douros agreed to have his architect draft new plans for a smaller building. Read more. The Bulletin reports the Bellevue Hill Neighborhood Association meets Wednesday at 7 p.m. to discuss a possible apartment building on the site of a long abandoned gas station on Belgrade Avenue at the parkway. The meeting will be held in the E-5 police station. Prescient drivers who brought long books with them had plenty of time to catch up this morning. Hyde Park Avenue into Forest Hills was, once again, a complete mess. It was joined this morning by the West Roxbury Parkway and Arborway/Jamaicaway where delays stretched way back, in turn causing a backup on Walter Street that extended all the way to Henry's, where, at least, motorists could stop for a candy bar and a lottery ticket. There are some amazing trees in West Roxbury today. Also see Brad Kelly's photo of Mt. Auburn Cemetery. Large group of males dueling with golf clubs. They must have played through, however; they were gone when officers arrived. There were two guys hitting golf balls on the side of the West Roxbury Parkway by Weld Street this afternoon - one of which rolled under our car as we headed toward Roslindale. Idiots. The Tab reports a big water main break at Grove and South streets is making a mess of traffic. Officials are working with Temple Emeth to minimize the impact on Rosh Hashahnah services. Normally, when a road gets torn up, you can expect weeks of unremitting commuting pain as you navigate among the barrels and raised grates. I was certainly expecting that when crews started tearing up the parkway between Washington Street and just past Bellevue Hill Road on Monday. But by last night, they were actually finished - the road is nice and smooth and all that's left is to put down the permanent lane stripes.